Pair this cool printed playsuit with a neutral day bag and flats for a great day out. Pull on an AXP cardigan and you can even rock this playsuit when it’s cold! 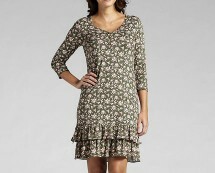 V-neck jersey dress with a short button panel at the neckline and a frilly hem. Machine washable. Length from approx. 88 - 96 cm. 95% viscose, 5% elastane.